Muhammad Ali had already thought of becoming a boxer by the age of twelve and said he took up the sport in the belief that “it was the fastest way for a black person to make it in this country”. 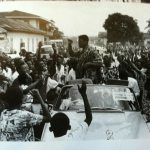 At the age of twenty-two Ali won the gold medal in the light heavyweight division at the 1960 Rome Olympics and the champion’s fame soon spread across continents and colour divides. However, Ali became increasingly representative of a new rebellious athletic sensibility, along with his racial pride and a growing interest in Islam. His resentment of the American war in Vietnam also established Ali as a notable conscientious objector and earned him the scorn of the US military establishment. 25 February 1964, as Sonny Liston quit the bout against Ali in the sixth round, the new world heavyweight boxing champion threw his fists in the air and shouted at the reporters: “I am the greatest! I shook up the world! I’m king of the world! Eat your words!” Present ringside was his mentor Malcolm X. Elijah Muhammad and the Nation of Islam had up till that moment been reticent to publicly accept Ali as one of them. This changed matters. Immediately following the fight they announced to the press Ali’s conversion to Islam along with his new name, Cassius X. The X represented a denial of the given ‘slave name’ Clay and symbolized the unknown African family name. In the coming weeks Ali accompanied Malcolm X to the United Nations, saying: “I want to meet the people I am champion of.” He wanted to travel to Africa. 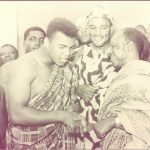 On Sunday 14 May 1964 Ali left Chicago for Accra’s Kotoka Airport following an invitation extended by President Kwame Nkrumah, patron of the Ghana Amateur Boxing Association. Nkrumah was the undisputed flag-bearer of Pan-Africanism, of Black Consciousness, and of self-determination for all people. 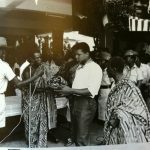 It had been more than three decades since the Asantehene (king) had returned from the Seychelles after enduring exile imposed by Britain. Ghana finally gained independence from Britain on 6 March 1957. By now, Ali had already held the world heavyweight boxing title for two years. 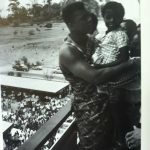 This would be his first appointment since becoming champion and the first visit by an African American sports star to Africa. Yet there was no coverage by any American media at all. Travelling with Ali were his brother Rahaman, road manager Osman Karriem (previously Archie Robinson and sent to accompany Ali by Malcolm X), Herbert Muhammad (third son of Elijah Muhammad of the Nation of Islam who would later become Ali’s manager) and Howard L. Bingham. Howard L. Bingham has been Ali’s photographer-biographer and best friend since 1962. One of his earliest assignments was to photograph the emerging amateur boxer Cassius Clay. The Louisville Lip from Kentucky was in Los Angeles to fight George Logan. After the fighters’ press conference, he saw Ali standing on a street corner with his younger brother Rudolph Valentino (later Rahaman Ali) and he offered to show them the sights. The friendship endures to this day. The two friends call each other ‘Bill’. Bingham was also involved behind the scenes when Ali was elected to carry the Olympic torch at Atlanta in 1996. Bingham estimates that in over half a century he had recorded the tumultuous life of Ali the man, activist and boxer in more than a million photographs. In 1993 he published Muhammad Ali: A Thirty-Year Journey, an acclaimed tribute to his friend in black and white photographic images. 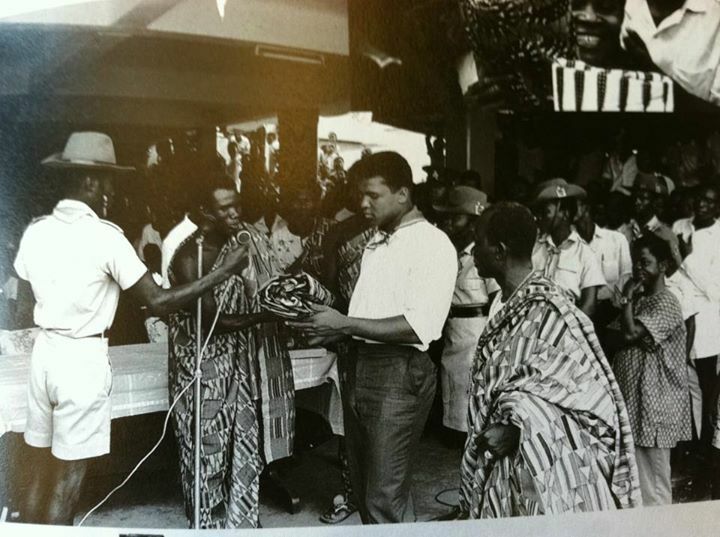 When President Kwame Nkrumah received Ali the day after his arrival, he presented him with the deeds to some Ghanaian land, and an Oyokoman kente cloth. 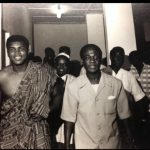 Ali said of the meeting: “When the two of us met last Monday at Flagstaff House, I humbled myself before him, a thing I rarely do, because I saw in him a dedicated man who is anxious to free Africa and bring unity”. Nkrumah did not take offence. 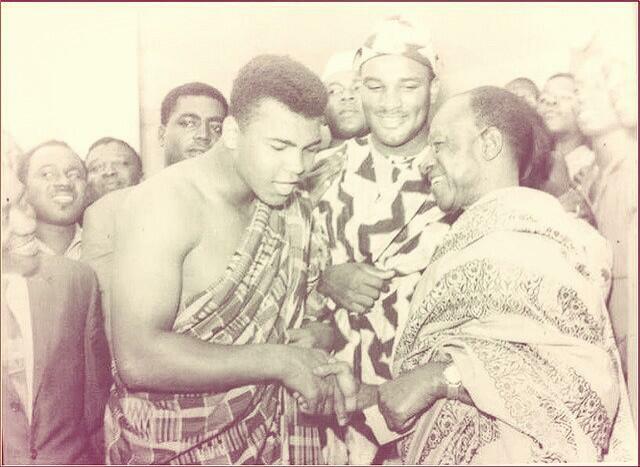 President Kwame Nkrumah was the first politician or head of state to acknowledge Ali since he had become world champion. It was another ten years before an American president would meet Ali – President Gerald Ford invited Ali to the White House on 10 December 1974. Ford was a boxing fan and also said he wished to make some reparations for the racial animosity of the 1960s. Historically kente [ken-tay] was the ceremonial cloth of kings. The name is derived from ‘kenten’ meaning basket. Originally raffia or bark was used in weaving cloth and because it resembled baskets, became known as kente. 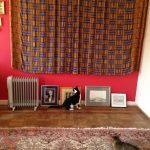 The different configurations of pattern and colour usually have particular names denoting function and are also frequently named for persons of historical significance. During the Nkrumah era one such pattern was named for his Egyptian wife Fathia, as Fathia fata Nkrumah [Fathia befits Nkrumah]. The inherent message of the Oyokoman is that “the new chief should be wise in using his power”. Oyokoman is the royal clan from which all Asantehenes or supreme rulers are descended. The fabled coloured patterned silks of the Asante royal court were already known to the Portuguese circa 1430 CE and the Danish in 1650 CE who were among the earliest colonizers of the Gold Coast or Slave Coast as Ghana had previously been known. Silk from southern Europa arrived by trans-Saharan caravan, and even silk garments were painstakingly unravelled and woven together with local cottons and wool. The finished cloth would be of an impressive size and substantial weight, to be worn over the shoulder in the same fashion as the Roman toga. Currently there are a handful of important kente markets in southern Ghana. The largest known kente, some 3.7 x 6.1 meters, was presented to the United Nations when Ghana attained membership. Kente today is an affirmation of Pan-Africanism and the diaspora of African peoples. The dominant colours of the Oyokoman being red or maroon, green, yellow or gold, and black were employed in the flags of newly-independent African nations and black self-determination movements, including Rastafarianism. President Nkrumah designed the flag of a free Ghana himself. In a nod to the Ethiopianism movement of the 1890s, a precursor of Garveyism and Pan-Africanism, he inverted the green-yellow-red of the Ethiopian flag and replaced the black lion with a black star. Kente is an instantly-recognizable feature of modern African dress. The international popularity of the design also sees it reproduced as embellishment on all manner of clothing, accessories and other goods. 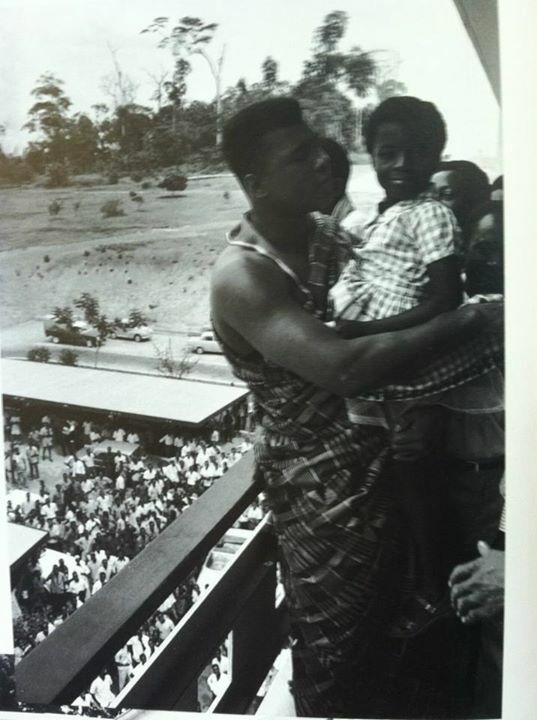 On that first month-long visit to Africa, Ali stayed in Ghana for two weeks. 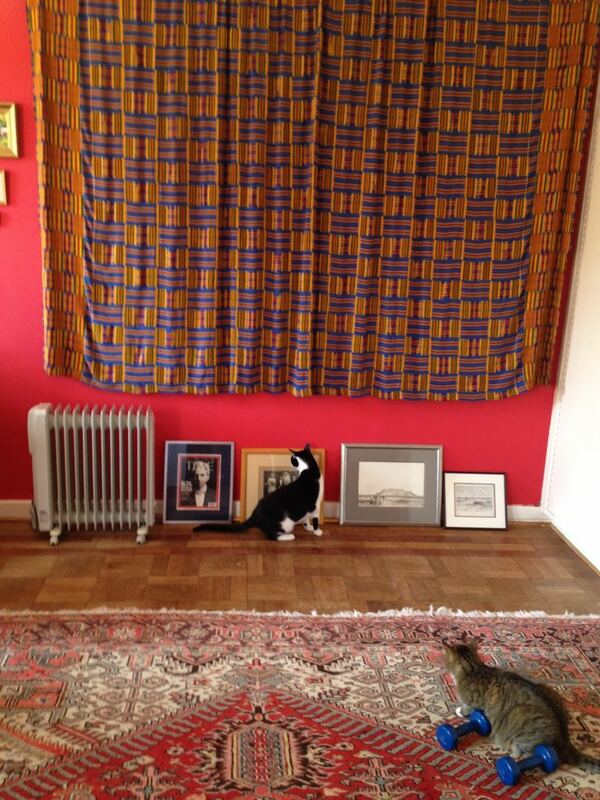 Throughout his stay he was seen wearing a variety of kente cloth designs. 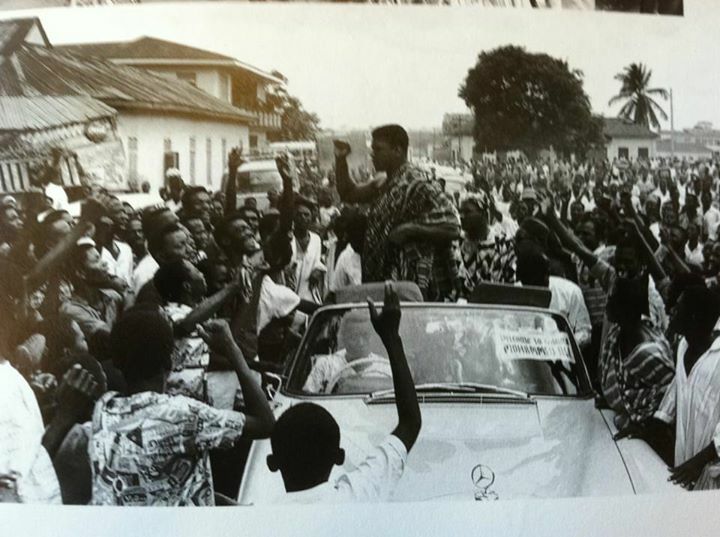 Thousands of people cheered the champion along the streets of Accra, they crowded Ali at exhibition boxing matches, visits to schools and factories, attending a music concert, even attempting to unseat the legendary Okomfo Anokye sword plunged into the ground two centuries earlier by an Asante high priest. 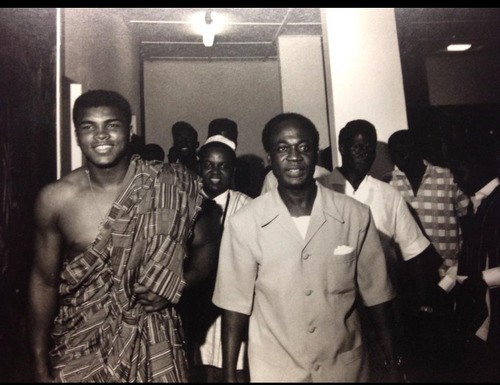 The brief confluence of the impact of Pan-Africanism and the rise of Black Power in America was certainly embodied in the meeting between Kwame Nkrumah of Ghana and Muhammad Ali of America. Muhammad Ali went on to win fifty-six times in a twenty-one year career. Update: Muhammed Ali passed away on 3 June 2016 at the age of 74.